I'm back to share a final card using the fabulous Simon Says Stamp February 2016 Card Kit. 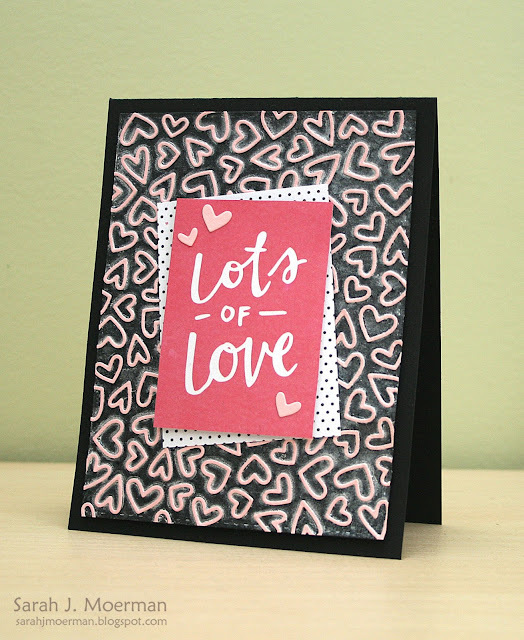 For today's card I decided to use the fun little Simon Says Stamp Mini Hearts Outline Dies to create a custom background on a panel of Simon's Black Cardstock that was die cut using the largest of Simon's Stitched Rectangles Dies. 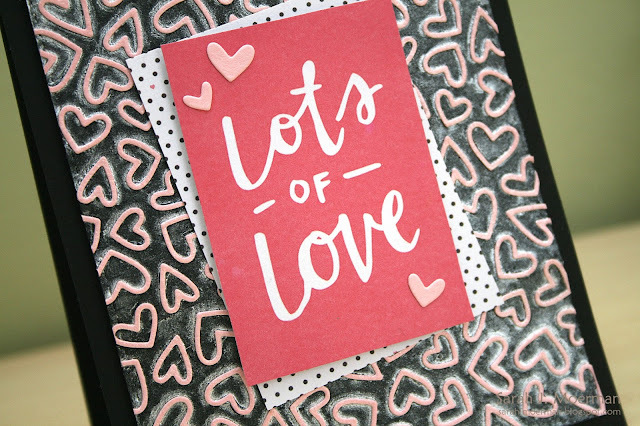 I die cut a whole lot of of the Mini Hearts Outline shapes from Simon's Cotton Candy Cardstock and adhered them all using Ranger's Multi Medium Matte Adhesive in a Quilled Creations Precision Tip Applicator Bottle. I then filled a Ranger Mini Mister Spray Bottle with water and some Ranger Perfect Pearl Perfect Pearls, shook it up, and spritzed the whole panel to give it some shimmer. Once dry, I adhered the panel to a notecard made from Simon's Black Cardstock using foam tape. 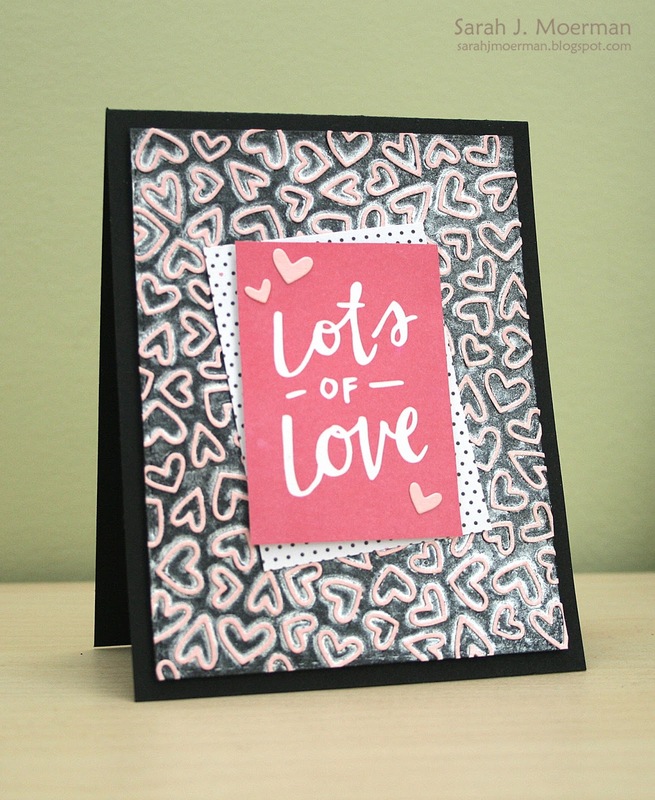 I cut out the 'lots of love' sentiment from a piece of the Crate Paper Hello 6x6 Papers and using more foam tape backed it with another piece of patterned paper from the same pad. I adhered this matted panel to the card front using Tombow Xtreme Permanent Adhesive Tape Runner before adding a few of the die cut heart centers. 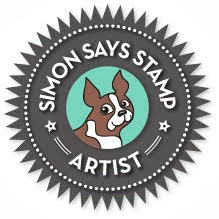 If you're interested, you can pick up the Simon Says Stamp February 2016 Card Kit for just $29.95 + shipping. If you'd like to receive this kit and future kits for only $24.95 + shipping per month, you can SUBSCRIBE HERE. 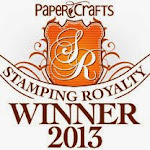 Heidi, owner of Simon Says Stamp, has given me an extra February Card Kit to pass on to one of you! 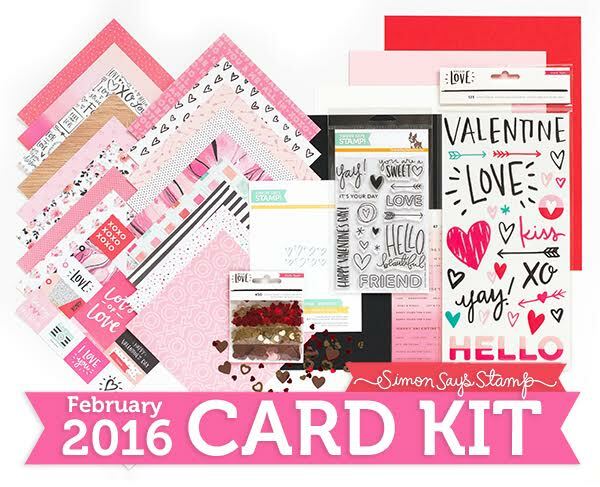 Just leave a comment on any or all of my February Card Kit posts and I'll announce a winner Friday January 29th. Sara I love all of your creations using this kit! Especially love the perfect pearls on todays card. Thanks for your chance to win! That's such a fun background, especially with all that shimmer from the Perfect Pearls! So pretty! That's a lot of hearts to glue down lol...way to go! Love all those mini hearts! Great card! Another fabulous card, Sarah. love this kit! Oh goodness, what work you must have put into this, but wow, the results are absolutely fantastic! I love your background! I struggle with what to put on top of my backgrounds when I want the background to stand out. You did it perfectly. Great kit! I love the background with the hearts and Perfect Pearls. I bet it looks even better IRL. Oh wow, what a nice card, and card kit too. Thanks for the chance to win. Gorgeous card! I love the background! I've always wanted to try the SSS kit - thank you so much! Just a fantastic background. Great job. Your creativity is amazing Sarah! I absolutely lovely that breathtaking background. This is so pretty. The background looks fantastic! Wow! This is so awesome! Those hearts are perfect for background and love the colors! Awesome! I love how you did the background on this one. So fun!!! What a fun card you created with the heart outline die...great creative design. How cool is that background, very striking design!!! Oooh love the heart background!! Looks awesome! Love the background on this card! Oh I love this card! And it looks so great on the black card base! Such a cool effect, Sarah! And I love how the perfect pearls pooled around the heart die cuts too. It gave such an interesting background. You do the most interesting things with the card kits! Thanks, Paulette S.